Shoulder piece is 1 1/4″ wide by 8″ long with rounded ends and artificial sinew edge stitching. Lined on the back side with new suede leather. All edges dressed and burnished. 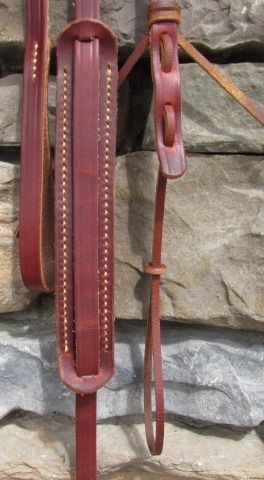 Main strap is 1/2″ wide and slicked smooth on the back. Your choice of adjustable (+/- 2″) leather lacing headstock/scroll loop or sewn non-adjustable headstock/scroll loop, both options shown in the photo. Sewn on 1″ wide end button tab. Choice of one, two, or three button holes in end button tab. .